Lauren M. Weber is a musical theatre voice specialist focusing on contemporary commercial music (CCM) and functional voice training. Currently a Lecturer of Theatre in Musical Theatre (Voice) at Baylor University, she has a Master of Fine Arts in Theatre (Musical Theatre) and a Master of Music (Vocal Performance) from Minnesota State Mankato and a certificate from the Contemporary Commercial Music Institute at Shenandoah Conservatory. Her undergraduate degree in Music was from the University of Oklahoma. Lauren's area of expertise is musical theatre, with an emphasis on the singing voice and related research in vocal health, function, and pedagogy. She teaches the introductory voice class and lessons for Freshmen and Sophomore Theatre majors, focusing on vocal technique in contemporary musical styles. 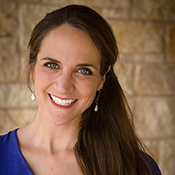 In addition to teaching voice, she has also served as Music Director and Director on various projects at Baylor and the surrounding community. As a lyricist/composer, her children’s musicals have been performed in Central Texas, Minnesota, Iowa, and Wisconsin. Performance credits include local/regional theatre, opera, and concerts as well as performing as a solo artist with numerous bands in the area. Lauren was recently certified by Sheri Sanders as a level one Rock The Audition coach. In 2018, Lauren trained in Vocology with Dr. Ingo Titze at the National Center For Voice and Speech. Vocology is the study of voice focusing on the science and practice of voice habilitation. It involves the nature of speech and language pathology, laryngology, voice training, voice pedagogy of song and speech for actors, and relies on knowledge of vocal anatomy, physiology, biomechanics, perceptual-motor learning principles, acoustics, the physics of sound, and vocal pedagogy and practice. Lauren is passionate about enhancing the arts in Central Texas. She is currently the Co-Vice President of Productions for Therapy Center Stage, serves on the board of Mission Waco’s Jubilee Theatre, and is a part of the play selection committee for the Waco Civic Theatre. Additionally, she is an active member of St. Paul’s Episcopal Church, where she serves as the Family Service Music Director for the 9 am service. Lauren is also a Green Dot Certified Trainer and a part of the “It’s On Us” work team, striving to put an end to interpersonal violence. Membership include National Association of Teachers of Singing, Voice and Speech Trainers Association and Musical Theatre Educators Alliance.